KANSAS CITY, Kan. — It’s hard to go a day without play. Games, activities and a variety of entertainment are woven into the fabric of our daily lives. But those who work with youth in Wyandotte County parishes learned that play can also be a spiritual experience — one that brings us closer to God — as they participated in a training session on the theology of play Nov. 10. “The purpose of these trainings is to equip those that are working in ministry with young people with tools to serve their youth better,” said Liz Miller, Wyandotte County youth outreach coordinator. The hope is that they gain confidence when ministering to the youth in their lives, she said. Attendees affiliated with a Wyandotte County parish earned grant money for their parish by attending; the money goes toward their middle or high school youth ministry. 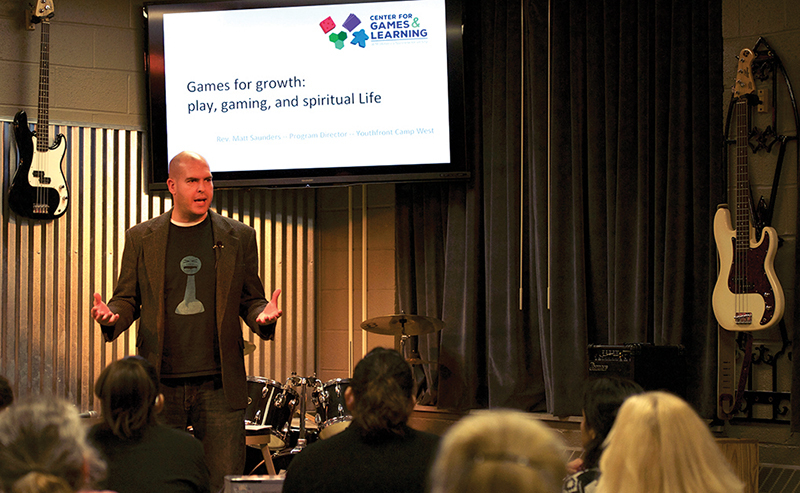 The event was offered by ReachKCK youth ministry and included a presentation by Matt Saunders, a board game designer and program director at Youthfront in Mission. “My goal this evening is that you walk away from here tonight feeling a little more inspired, feeling a little more passionate about what you do with young people, and that your mind and your heart have expanded with more love for what you do,” said Saunders. Saunders presented a variety of topics relevant to the art of playing and how it can be used as a tool to teach young people. “Our culture is fascinated with play,” he said. “Play is everywhere. Play is a chance to grow in relationship with God as well as our peers, said Saunders. “By grace, we are able to taste and see how good God is, how good this creation is, how we can engage with the creation and playfully interact,” he continued. “Playfulness allows us to embrace each other and to embrace all of creation. Father Karl Good, CMOP, associate pastor of St. Patrick Parish in Kansas City, Kansas, attended the event to learn more about techniques used in youth ministry, as St. Patrick is considering starting its own youth ministry program. “Play is used for development and teaching in many ages, starting from babies to adults in the work force,” said Father Karl. “It can develop imagination to dream big, which can lead to invention,” he added. Luz Diaz, director of formation and communication at All Saints Parish in Kansas City, Kansas, hoped to learn about engaging youth in more effective, creative ways. Providing training like the “theology of play” event is crucial in giving those who work with youth quality development, said Miller. “It is so important for those involved in ministry to take opportunities to be renewed — both personally and spiritually — so that their ministry flows, not just from themselves, but from God’s never-ending font of energy and inspiration,” she said. The next Wyandotte County youth worker training session will be on March 7, 2017. Deborah Nearmyer, director of faith formation at St. James Academy, Lenexa, will speak on prayer experiences and facilitating an encounter with Christ.